There are many castles in Japan but only 12 castles that are considered “original” and Himeji Castle is one of them also the most beautiful castle in Japan. Anyone who is visiting Kansai – Hiroshima region should include Himeji in Hyogo Prefecture. From Osaka to Himeji took about an hour and a half by car and by Shinkansen, it takes 30-40 mins. We are on our way to Hiroshima and we made a detour to Himeji to check out the icon of the city, the Himeji Castle. We parked our car near the train station and the “shotengai”/shopping streets of Himeji. If you are taking the train, you will see Himeji Castle once you come out of the station. It can be seen from afar as it is located in the hilltop. Walk along Otemaedori street as it is the main street of Himeji town and as you walk towards the castle, the castle appears to look bigger. Both of the sidewalks are wide for pedestrians so it is pretty comfortable to walk. As you walk you can see some interesting bronze statues created by the leading sculptors of Japan. During my visit, there is a festival for the special kids in the square of Otemaedori Street. Himeji Castle is voted as one of the most beautiful castles in Japan as the whole building is in white color, pretty unique. It also has another name called White Heron Castle due to its color and perches on the edge of the situated location just like a heron. At the entrance, there are some bonsai plants. In autumn you get to see the flower of this season displaying everywhere; at the temples & castle entrance, chrysanthemums are one of the common flowers which represent autumn. Some of the original main pillars which were made from Japanese cypress. Including garden: Adult 1040 yen (USD9.45) & Children 360yen (USD3.30) You may want to add in a little more fees to see the Japanese garden. Himeji Castle was the first in Japan to be registered as a UNESCO Cultural World Heritage in 1993 as well as designated as a National Treasure in 1951. The roof was printed with beautiful details such as flowers & butterfly print. The interior of the castle is made from wood including the wooden floor so visitors are not allowed to wear shoes to walk on the wooden floor. Visitors are given a plastic bag to hold shoes and walk around with the plastic bag. As you can see, it is very crowded especially during public holiday and weekends as this is one of the must-visit castles in Japan. On top of the rooftop of some temples or castle, you can usually spot Shachihoko 鯱鉾 or shachi 鯱 is an animal in Japanese folklore with the head of a tiger and the body of a carp. It was believed that this animal could cause the rain to fall so it protects the building from fire. I have also seen a pair of Shachihoko (fishtails in gold) at the Todaiji temple in Nara. There are stairs to the highest point of the castle and the staircase can be very narrow and steep. At the top, you will be rewarded with the beautiful skyline of Himeji city. Most castle I have visited has been experiencing some sort of damage such as fire and earthquakes but Himeji Castle has never experienced any severe damage from the natural disasters which is quite unusual. Himeji Castle is also the movie scene for James Bond Movie, “You Only Live Twice” released in 1967. In the film, Bond visits the castle which houses a ninja training center but in real life, the castle is a tourist destination. You also spot some tourists dress in ninja costumes for free photo shoots. Japanese famous director Akira Kurosawa also shoot a few of his films here; “Ran” and “Kagemusha”. Another interesting feature of Himeji Castle is it has a unique defense that many other Japanese castles do not have. That path maze to the main keep has many “dead ends” as this is to prevent the attackers from entering. 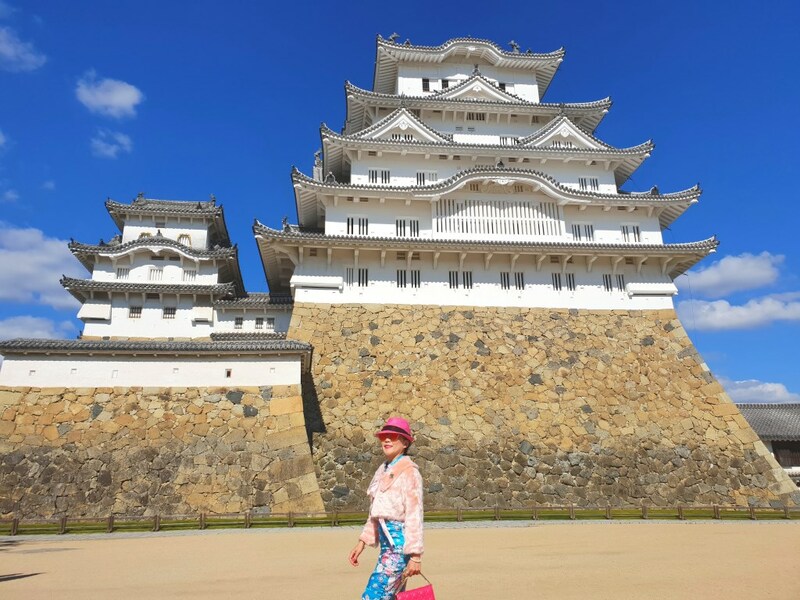 I have visited quite a few castles in Japan, eg Kumamoto Castle & Matsumoto Castle and I have to admit that Himeji Castle has gotten my vote as the best among all. That castle and the grounds are so beautiful! I love Japanese architecture. I think it’s gorgeous. The lines and use of wood always amaze me. Himeji Castle stands strong after so many years and never been damaged by the natural disaster such as earthquake as you know Japan is in the earthquake zone. This is one of the top castle and considered the most beautiful castle in whole Japan. Japan is a perfect destination in Asia, very safe and easy to explore. It has so many things to offer and most importantly is the thing here can be very cheap. Japan has so many castle but Himeji Castle is Hyogo Prefecture, about an hour drive from Osaka is one of the most beautiful castle in Japan. If you are visiting Kansai area, do include Himeji Caslte in your itinerary. I love how Himeji Caslte was painted in all white so it is also called as “White Heron” Castle. This is the only castle in Japan that is painted all white. What a gorgeous castle! Everything looks so clean and organized in this town, too! Japanese take pride in keeping their locality clean and tidy so don’t be surprised the castle is so clean and organized. I guess education to the people is so important, it was taught since they were born. Wow! This place looks amazing! Wish I could be here right now! I had visited Himeji Castle and this place is the best among all, I just love the walk in the castle itself is scenic with all these Cherry Blossom trees, I could still imagine how beautiful it would look like with everything in pink. You are so lucky to be here in the cherry blossom season. I was here in the autumn so there is no cherry blossom but I was told during the spring season, the cherry blossoms are just stunning as there are so many cherry blossom trees planted around the castle. Japanese arhitecture is so beautiful. The cherry blossom trees makes the castle so romantic !! Such beautiful architecture and culture! My mom was raised in Japan and it’s on my bucket list to visit someday. I’ll put this castle on my list! Glad to hear that your mom is raised in Japan so I guess you are familiar with Japanese culture. Visiting Japan should be fun for you if you have already been exposed to Japanese culture. The entrance fee sure is cheap. What age is a child? Under 12? Under 18? Or basically just if they’re travelling with the parent? It certainly is beautiful architecture. The child who is traveling with parents ( elementary school and Junior high school) cost children price. I guess it is under 18 years old. It also applied to the foreigner. That truly is a beautiful castle, what wonderful architecture. I can see why it is so busy! Wow, Japan is one of wonderful place that I want to visit and everything in that castle is really beautiful. You are so lucky to see that place! That’s really neat, I have never seen a castle quite like that one. I bet my daughter would enjoy this one. She is really interested in Japanese architecture and design so this would be a fun one to check out for her. The white castle has an elegant structure. I love trees outside the place. Thanks for sharing this amazing place. Wow, that castle is so beautiful, everything about it, is just so fantastic. I really love this country. I have a fascination with castles and would love to visit these places and see them in person. Your photos are stunning! I loved your cute outfit, too. The castle really is beautiful, I would love to visit both China and Japan someday. I’m definitely putting the White Herorn Castle on my to visit list when I eventually visit. China is another interesting country to visit too, I have been there several times and every destinations give me surprises. I can’t believe i’ve never been to Japan yet ughhhh…Soon i promise. Thanks a lot for the amazing post. Those chrysanthemums are simply perfect! Just like that castle! The chrysanthemums resemble the flowers in autumn in Japan so you get to see chrysanthemums flowers in most of the places, eg at the entrance of the restaurants or museum etc. This is the first time that I have known about that castle. The Himeji Castle looks really magnificent and I love the view. What a beautiful place. I never been to this castle when o was in Japan and for sure I will go back and visit here. Japan is truly incredible! Every city I’ve seen has it’s own unique look which I love. Someday, I hope to visit. wow looks incredible! What stunning architecture! Wow, so many beautiful places to see! I adore all of the architecture. I need to visit!